Monkey see monkey do! What is good for my big brothers is good for me too! I am not ready to potty train Nathan. It is still winter and I potty train in the summer when they can run around in a t-shirt and nothing else. We will see if I can make it that long with Nathan. He is convinced that he is not a baby and that he is and has always been one of the "big kids". 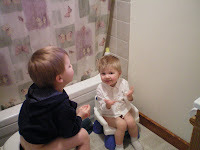 Yes he really did go on the potty, not just sit on it. Oh and thank you Steve Jackson, if you are reading this. Even though we did not make our bathroom bigger, it sure is ALOT nicer.